A couple of hours later I went out with them intending to feed them and shovel out the kennel runs and clean up the yard. I shoveled snow up around the kennel to help block the wind and keep it a little warmer given the conditions. 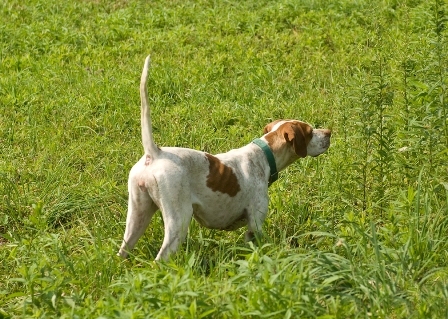 As I was piling snow around the kennel Nell the two year old pointer was right there with me. After piling the last of the snow I fed the dogs and was surprised Nell was not right there. A young dog is almost always eager to eat. I continued to shovel in the yard and Rocky the older dog went into his kennel run but still no Nell. I began to call while finishing up my snow clearing chores. No dog appeared. Now concerned I called more loudly but nothing. Deciding that she would have left tracks away from the kennel where I last saw her I began to look but not one track to be seen. In an instant it dawns on me that she must have crawled under the kennel to check for mice and I shoveled her in! A few shovels full of snow and there was a little black pointer nose. Eager to be let out from her dark crouched spot. A relief for both of us. Reminded me of a story long ago when Copper (another pointer in the picture) had slipped into the house and spent the day in the living room while I was searching for her all over the neighborhood. A couple of good dog gone stories if you ask me.